This section of the walk had to be one of those most gruelling yet. Yesterday Jamie and I had a day off as the weather was really grim again and it rained all day. We just couldnt face another day in the rain. This summer has been really bad and lots of places down south have been flooded really badly. Its all to do with the gulf stream being much further south than it usually is and consequently it has dumped a whole lot of rain on the UK. Not sure if its an effect of global warming but I would suspect that it is a sign of things to come and we had better get used to it. The road from the hotel at Kylestome to Clashnessie has definitely got to be one of the craziest road in the UK. It’s a B road but it just cuts across ravines and the gradients are pretty intense. Even driving the campervan was a bit scary because you couldnt see what was coming round the corner at you. Anyway, we managed to go up and down the hills and eventually came into the small village of Drumbeg which had the best village shop in 2006. We were more interested in getting into a cafe and we found one at the edge of the village. It was a ,(and before I hear you guffawing at my inappropriate language, but I can say that for once I wasnt being cynical) small oasis of cool tranquility. 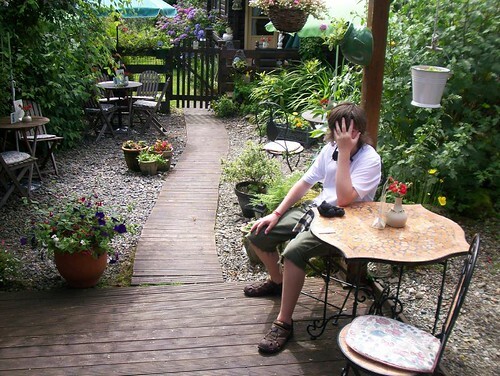 It was just a small tea room that had a lovely garden outside which was protected from the elements by a hedge to one side. The difference between the stark rawness of the sourrounding countryside was what probably took me by surprise. After Jamie and I had had our refreshments, I headed off on his bike to get the van. The van was only ten miles away and I thouight I’d be there and back before the tea room closed, but the journey back up those hills was absolutely knackering. It has been a long time since Ive really felt my heart bursting out my chest, but the walk back up those hills pushing my bike nearly wiped me out. God knows how the cyclists at the Tour de France manage the mountain climbs. Well actually I do know how they do it. But then Im over 50 but even then I cant get my head round how they could manage those sections. After we returned, we parked at a scenic point at the top of the village of Drumbeg and we were just about falling off to sleep when we were disturbed some sheep that decided to shake the van by rubbing against it. Then to make matters worse , one of them started coughing rheumatically like an old man with TB. 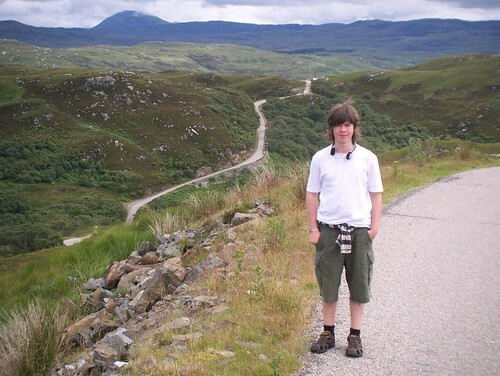 This entry was posted on Monday, July 16th, 2007 at 11:17 pm and is filed under Scotland, trail, Travel, walk. You can follow any responses to this entry through the RSS 2.0 feed. You can leave a response, or trackback from your own site.